There is just something ethereal when it comes to the colour white, isn’t it? A vision in white is always breathtaking. And though the pop of colours is always appealing, the white will catch more attention every time. This summer, why not include this beautiful hue in your work wardrobe with a touch of sass. Here are some amazing Professional Ways to Wear White for Work. There’s a reason why your work wardrobe has to be different from that of your casual one. With professional outfits come a bit of restriction and rules that should be followed best. However, that never means that your work outfits need to be boring. A full vision in white is not just for a bride anymore. See how this graceful colour rocks your appearance in style. Wear an all-white outfit to your work and don’t worry, it will look great. It wouldn’t be wrong that this would be a safe side since you wouldn’t need to worry about a pairing business here. Just don up white pants with a white blouse. You can add a white jacket on it and finish it with matching pumps and accessories. You cannot beat a basic monochrome outfit. Take a look here for more such appealing work outfits. A colour varies in hues when it is in different texture and fabric. It would be a great thing to mix up a few textures with a white colour palette. For instance, you can wear a silk white shirt with white trousers such as chinos and a matching white satin jacket. Or you could try with a white satin dress with sheer sleeves. The combinations are numberless. Create different fusions of your own. If you are a fan of pencil skirt then you must have a look at this. Basic colours are always recognized in the crowd. So if you are thinking of pairing something black with your white then go ahead for it without hesitation. Since we are talking about all things white, we will try keeping the main focus on white hue only. You can try an all-white outfit with a black statement necklace or earrings. Adding accessories in black with an all-white outfit will be a great idea to include black in this white ensemble. 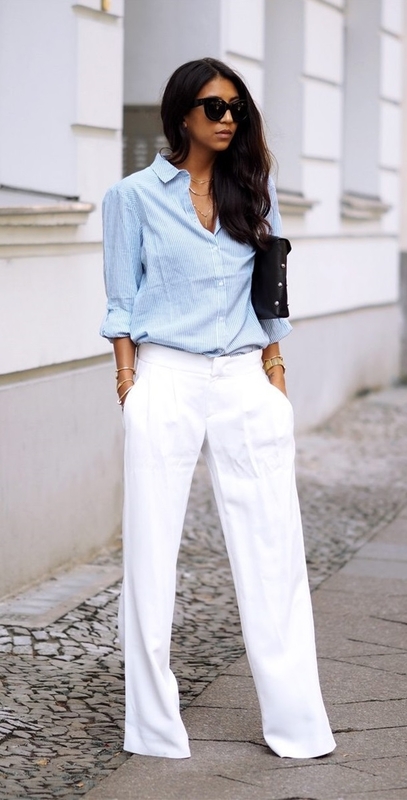 Or you can always pair a white shirt with black trousers and rock it. If you want to look a bit slimmer than you already are then these tips will come handy to you. When it comes to white, there is no chance of any other colour being off-limits. The white can be paired with every colour available in nature and it sure as hell would never be a disaster. So try popping some colours with your white ensemble here and there. You could try an all-white outfit with the bright coloured accessories such as red pumps and matching bag. Try other bold colours such as striking pink, yellow, blue, etc. Here is how you can wear red heels with different fashion outfits. Prints are always lovely and are always on trend. Whether to choose a bold print or subtle, that is up to you. Try a white tee with a skirt having bold prints or a white blouse with patterned pants. Choose the pattern that you know you could easily pull off. Bring in a white t-shirt if you don’t already have one. Or maybe not just one, bring lots of them in different designs and patterns. They are going to come handy for what I am about to tell you. Dress for the office today in a cap-sleeve tee and a chambray midi like this. 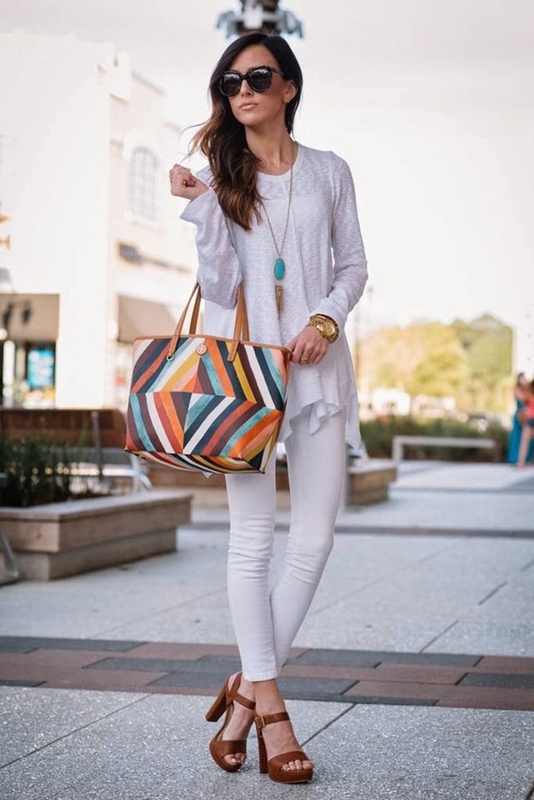 White Moccasins and black tote bag add more flair to this simple ensemble. If you are a bit on the curvy side then you must try wearing these outfits. Layers are a part of your outfit so you can’t just ignore them. Using white layers in different ways is a good idea to include this colour in your work outfits. You can wear a white shirt under a sweater in cold days or you could try a white jacket or a white trench coat in khaki. Here are different ways to wear a camel coat. If there can be men in black then there can be women in white! I know, too cliché but hey, it’s true. Don up a whole white suit for work today and see for yourself. Women can rock a suit just as much in style as men. If you don’t have a white suit then you can try something like pairing a white tee with matching wide-leg trousers and a white tailored jacket. Put on some bright red lipstick and finish the outfit with white open toe sandals to get a more chic look. There are so many fusions that you can create your own such as these elegant skirt outfits for work. So stop hesitating and start wearing white to your office. This is the colour that can never go wrong.